Celebrate Science Indiana, Indiana’s Premier Science Festival, is a public event that demonstrates the importance of studying science and the joy of discovery, the economic value of science, and its significance to society. For all age groups and for individuals from all walks of life, science impacts our daily lives, and the event aims to encourage young Hoosiers to pursue exciting, rewarding careers in science. Celebrate Science Indiana features interactive events and activities, and, whenever possible, it will provide take-home information, activities, or innovative ideas for further investigation. Prominent participants at the event include local and national science-based industries and businesses, federal agencies, educational institutions, and public institutions that have a major emphasis on science or science education, such as the Indiana State Museum and the Indianapolis Children’s Museum. 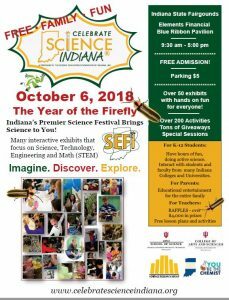 In 2018, Celebrate Science Indiana will be held in Indianapolis at the Indiana State Fairgrounds in the Elements Blue Ribbon Pavilion from 9:30 am – 5:00 pm on Saturday, October 6th. Click on below image to download a 2018 Celebrate Science Indiana event flyer (pdf format).